The Road to Two Degrees, Part Two: Are the experts being candid about our chances? The first part of this three-part series looked at the staggering magnitude and the daunting deployment timescale available for the fossil fuel and bioenergy carbon capture and storage technologies that many 2°C mitigation scenarios assume. In this second part, I outline Kevin Anderson’s argument that climate experts are failing to acknowledge the near-impossibility of avoiding dangerous climate change under current assumptions of the political and economic status quo, combined with unrealistic expectations of untested negative-emissions technologies. Kevin Anderson has just written a provocative article titled: Duality in climate science, published in Nature Geoscience (open access text available here). He contrasts the up-beat pronouncements in the run-up to the Paris climate conference in December 2015 (e.g. “warming to less than 2°C” is “economically feasible” and “cost effective”; “global economic growth would not be strongly affected”) with what he see as the reality that meeting the2°C target cannot be reconciled with continued economic growth in rich societies at the same time as the rapid development of poor societies. He concludes that: “the carbon budgets associated with a 2 °C threshold demand profound and immediate changes to the consumption and production of energy”. o Massive deployment of negative-emissions technologies. He notes that of the 400 scenarios that have a 50% or better chance of meeting the 2 °C target, 344 of them assume the large-scale uptake of negative emissions technologies and, in the 56 scenarios that do not, global emissions peak around 2010, which, as he notes, is contrary to the historical data. I covered the problems of the scalability and timing of carbon capture and storage and negative emissions technologies in a previous article. From Robbie Andrew, adjusted for non-CO2 and land-use emissions.Note that thesemitigation curves assume no net-negative emissions technologies deployed in the latter part of the century. The IPCC AR5 Synthesis Report informs us that if we want to have a better than 66% chance of avoiding a 2 °C rise in global temperatures our total emissions between 2011 and 2100 must be below 1000 Gt of CO2. Even if we held current emissions of about 35 Gt CO2fixed (something we are not yet on track to achieve), we would use up this quota in less than 30 years. At that point, to meet the target, we would have to stop the economy cold, which won’t happen. Between 2011 and 2014 we emitted about 140 Gt of CO2, taking down the available budget to 860 Gt. Anderson uses one of the more optimistic estimate of land use emissions in the IAMs for the rest of the century of 60 Gt of CO2 to reduce the budget down 800 Gt. The industrialization of developing nations and the transition to low-carbon infrastructures in wealthier nations will see process emissions from cement manufacture rise. Even with optimistic assumptions on the deployment of new low-emissions technologies the total, across the century, will be around 150 Gt of CO2. The budget now available for fossil-fuel emissions therefore shrinks to 650 Gt CO2, roughly two-thirds of the often-cited 1000 Gt amount. Side note: What Anderson’s Nature Geoscience article did not mention was the possibility that some carbon-cycle feedbacks that are unmodelled in the IAMs might shrink the budget even further. These would include emissions from the thawing permafrost, nutrient limitations on plant growth and die-back in tropical forests. There is no peer-reviewed, integrated assessment of these effects yet, but I did a very rough estimate that the permafrost and die-back feedbacks might amount to 200 Gt CO2 over the rest of the century even for a low-warming pathway. Therefore, instead of a 1000 GtCO2 budget, we might only have 450 Gt available for fossil-fuel energy emissions. Anderson, in a private communication, pointed out that the IPCC shows an optimistic double bias in excluding some carbon-cycle feedbacks in models (because they are currently deemed too uncertain and speculative), whereas they include speculative and untested mitigation technologies. Feedbacks aside, Anderson argues that to meet the 650 Gt CO2 target, annual reductions in emissions of 10% would be required. If you assume 3% in annual GDP growth, that would imply a 13% year-on-year reduction in carbon intensity per unit of GDP. Historical rates of carbon-intensity decline over the past 35 years have been around 1% per year. Quite clearly, to get to a sustained 13% over the next 35 years will require more than painless incremental change and giving current trends an extra nudge from modest carbon-pricing incentives. In his lectures (see links at the bottom) Anderson notes that economists conventionally see annual emissions declines of 4% as the maximum achievable). From Peters et al. 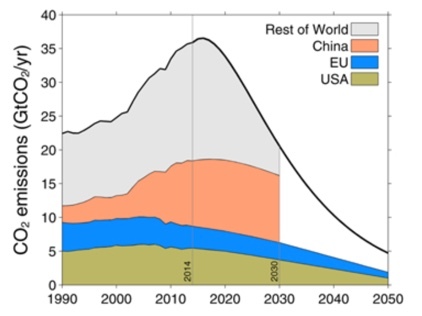 (2015) showing the projected emissions from the USA, EU and China based on the Intended Nationally Determined Contributions (INDCs) that will be presented at the December 2015 meeting in Paris. The black line is a pathway consistent with 2°C. Shortly after 2030, the USA, the EU and China, representing about 2 billion people, will have used up all of the world’s emissions on the road to 2°C. The grey area in the chart above represents the room left for the remaining 5 billion people. This group includes heavy per-capita emitters like Canada, Australia and Russia as well as poor, but rapidly industrializing countries in Asia and Africa with huge populations. It just doesn’t compute. Anderson’s case, in summary, is that most of us, whether scientists, policy makers or citizens, are suffering from cognitive dissonance. We acknowledge the mathematics of carbon budgets compatible with the 2°C target, yet are unable to face the revolutionary implications of what we need to do to get there. Put simply, our entire way of life for most of us in rich countries—and for an increasing number of rich people in poor countries—has to change radically, starting now. Explicit and quantitative carbon budgets provide a firm foundation on which policy makers and civil society can build a genuine low-carbon society. But the job of scientists remains pivotal. It is incumbent on our community to communicate our research clearly and candidly to those delivering on theclimate goals established by civil society; to draw attention to inconsistencies, misunderstandings and deliberate abuse of the scientific research. It is not our job to be politically expedient with our analysis or to curry favour with our funders. Whether our conclusions are liked or not is irrelevant. Yet, as we evoke a deus ex machina (such as speculative negative emissions or changing the past) to ensure our analyses conform with today’s political and economic hegemony, we do society a grave disservice — the repercussions of which will be irreversible. I admit to have been taken aback by the “curry favours with our funders” comment. For one thing, this is a bit too close to the myth that “scientists are conformists and only in it for the grant money” debunked with brio by Richard Alley. Secondly, many of the experts who are in a position to be listened to are in tenured employment and ought to be beyond the stage of needing to please their paymasters. In a personal communication, Anderson points out that the three biggest grant-giving bodies in the UK (NERC, EPSRC, ERSC) all have explicit mention of the having research contribute to fulfil government goals of increasing economic growth. For example, the EPSRC, the Engineering and Physical Science Research Council, expresses the intent of having universities “become centres of innovation and entrepreneurship, generating commercial success to fuel growth.” Quite clearly, the funding of research projects that might challenge or undermine these notions would be going against the political grain. Why then, if you accept Kevin Anderson’s arguments, are so few experts sounding the alarm in the way he does? Perhaps many experts really do disagree with his diagnosis. If so, one wonders why they don’t dispute rather than ignore what Anderson is saying. My impression is that his arguments cause discomfort, but nobody is willing to rebut them. Perhaps the scenario modellers are so absorbed in the details of what they are doing that they mistake the map for the territory. Perhaps it is a shared desire with the politicians to see a deal, any deal, made. 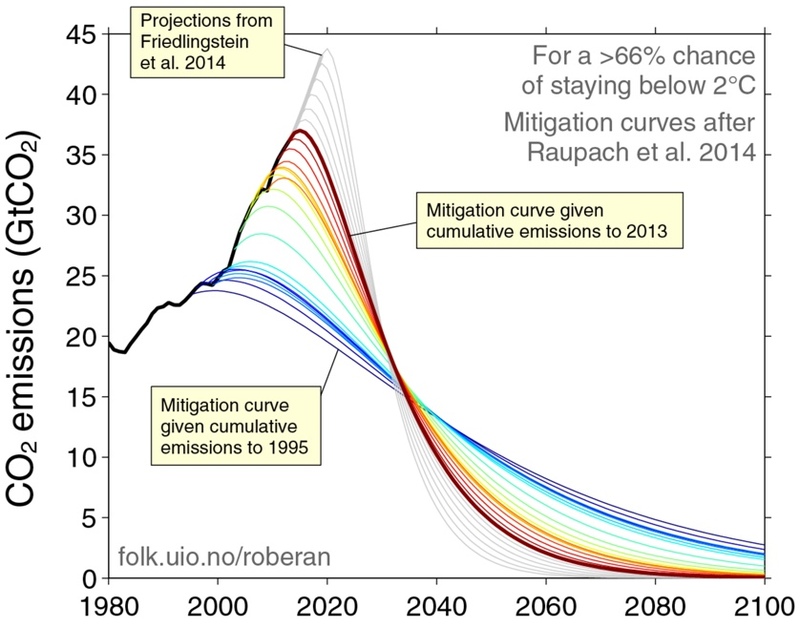 Some progress on mitigation, even if it is manifestly inadequate to reach the 2°C target, is better than none. Emission reductions we make today will reduce the cumulativeburden that we are passing on. Or perhaps, as Anderson notes, political expediency is what is driving this. The global “political and economic hegemony” in which growth-based economics is taken as a given and the political status quo is assigned the nature of an ineluctable fact, rather than an obstacle that we must overcome. The Republican Party’s complete refusal to accept any limits on greenhouse-gas emissions whatsoever is an unspoken force shaping the Paris negotiations. The outcome cannot be written as a formal treaty, since treaties require approval by the Senate, and Senate approval requires Republicans. Instead, the agreement will take the form of legally non-binding pledges, which the U.N. is calling “intended nationally determined contributions,” enforced by international diplomatic pressure. The entire world is, in essence, tiptoeing gingerly around the unhinged second-largest political party in the world’s second-largest greenhouse-gas emitter, in hopes of saving the world behind its back. Acknowledgement by prominent scientists and policy makers that achieving the 2°C target requires a globally coordinated and revolutionary overhaul of the world economy would surely only increase the unhingedness of the Republican Party. The GOP already controls both houses of Congress, the majority of state capitols and, according to some, stands a near 50/50 chance of capturing the Presidency in 2016. If the Paris talks do make progress, it is far from certain that the USA will follow through on its pledges. We have all the technologies and policy tools necessary to begin an immediate programme of deep decarbonisation. To deliver on 2°C requires a two phase plan. 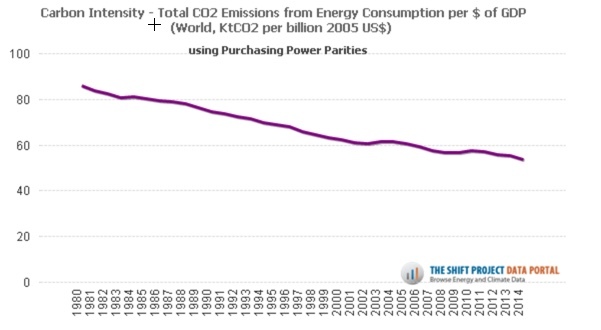 First, early and radical reductions in energy use by the small proportion of the global population responsible for the lion’s share of energy consumption, and hence emissions (see Chancel and Piketty). Second, and simultaneously, initiate a Marshall-style build-programme of very low-carbon energy supply alongside much greater levels of electrification. The details of different national approaches will vary depending on many factors, not least, renewable resources, existing infrastructures, population density, economic structure, and wider cultural and political characteristics. As difficult as radical mitigation may seem, failure may entail imagining a functioning civilization at 4°C or higher, which is even harder. The reason that credible action appears so difficult is because we have procrastinated for so long. Making an apparently impossible future possible is the challenge we face, but we won’t get there if we are not prepared to face the facts, unpalatable as they are. Here is a recent lecture by Anderson: The Ostrich or the Phoenix?…dissonance or creativity in a changing climate. For more details, with some overlap, watch this one: Delivering on 2°C: evolution or revolution? Thanks to Kevin Anderson for patiently answering my questions. In the last part of this series, I will look at perhaps the most difficult problem of all: the awkward questions of equity and fairness in allocating future emissions budgets between rich and poor. This entry was posted in Uncategorized and tagged Anderson, Mitigation. Bookmark the permalink.